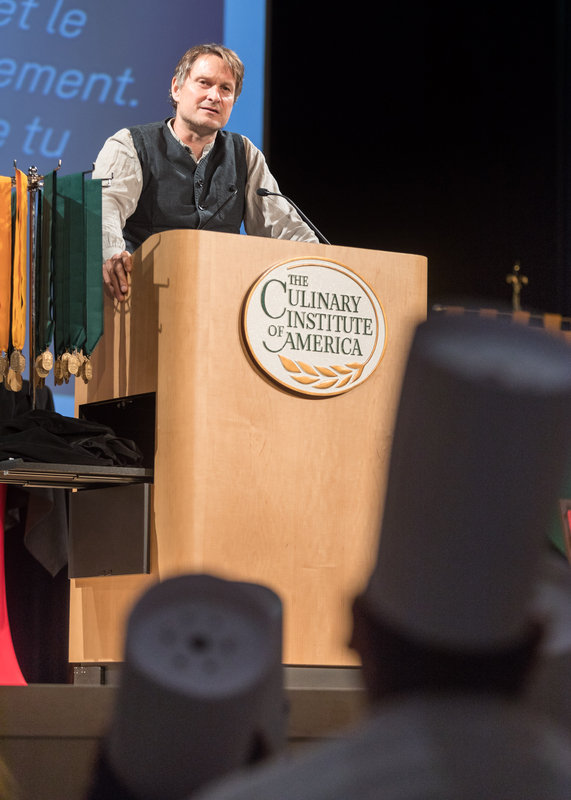 Hyde Park, NY – World-renowned restaurateur and culinary entrepreneur Claus Meyer spoke to graduates of The Culinary Institute of America during commencement ceremonies at the college’s New York campus on October 20. Considered the pioneer of the New Nordic Cuisine movement, Chef Meyer is co-founder of Noma in Copenhagen, Denmark, rated Best Restaurant in the World four times on the World’s 50 Best Restaurants list. Studio, the newest Copenhagen restaurant from the 53-year-old native of southern Denmark, earned a star in the Michelin Guide just four months after opening. The restaurant in his Great Northern Food Hall in New York City’s Grand Central Terminal, Agern, also holds a Michelin star. Also committed to philanthropy, Chef Meyer’s Melting Pot Foundation USA last year launched the Brownsville Community Culinary Center in Brooklyn, a community center, eatery, and cooking school offering free culinary training and healthy, accessible cuisine to neighborhood residents. The entire CIA graduation ceremony, including Mr. Meyer’s keynote address, can be seen online.